“What is Normal? Cognitive Exceptionality and Science Fiction.” Invited talk. 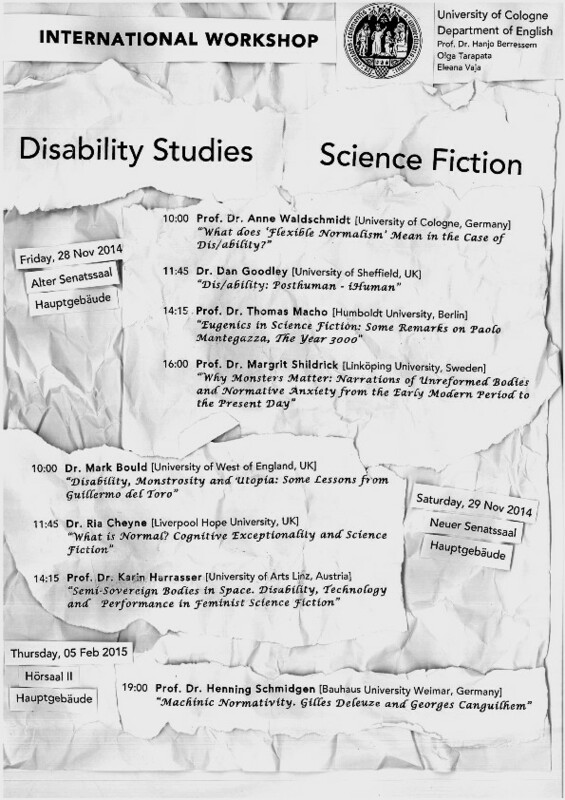 Disability Studies Science Fiction International Workshop, University of Cologne, Germany, November 2014. Powerpoint. “The Romantic Impairment: PTSD in Contemporary Romance.” Invited talk. Northern Network for Medical Humanities Research in association with DaDaFest. University of Liverpool, November 2014. Powerpoint. “Can Love Heal All Wounds? Disability and Cure in Popular Romance Novels.” Invited talk. Centre for Medical Humanities, University of Leeds, November 2012. Powerpoint. “Disability, Reflexive Representations, and Genre Fiction.” Keynote address. Culture, Disability, Theory: Encounters between Disability Studies and Cultural Studies, University of Cologne, Germany, October 2012. Powerpoint. “Changing Capacities, Changing Identities: Disability in Science Fiction.” Invited talk. DaDaFest Changing Capacities: Changing Identities (disability arts festival), University of Liverpool, September 2012. Full text and powerpoint. “Enabling Norms: Disability and Genre Fiction.” Symposium of Literary and Cultural Disability Studies, Liverpool Hope University, December 2015. Video. “Science Fiction, Disability, and Disability Studies: A Short Introduction.” Academic Track, Nine Worlds Geekfest, London, August 2015. Powerpoint. “Disability, Affect, and Genre Fiction.” Disability and Disciplines: The International Conference on Educational, Cultural, and Disability Studies, Liverpool Hope University, July 2015. Powerpoint. Storify Day 1. Storify Day 2. “Romance Novels, Trauma, and Cure.” International Health Humanities Network Conference: Traumatextualities, University of Nottingham, September 2014. Powerpoint. “The Blindman in the Romance Novel: Jane Eyre and the Representation of Visual Impairment.” The Fifth International Conference on Popular Romance Studies: Rethinking Love, Rereading the Romance, Thessaloniki, Greece, June 2014. Powerpoint. “Fearful Bodies, Fearful Minds: Disability and Horror.” Avoidance in/and the Academy: The International Conference on Disability, Culture and Education, Liverpool Hope University, September 2013. “Happily Ever After? Disability and Cure in Popular Romance Novels.” The Fourth Annual International Conference on Popular Romance Studies: The Pleasures of Romance, York, October 2012. Powerpoint. “Disability, Science Fiction, and Threshold Interpretations.” Transformative Difference: Disability, Culture, and the Academy, Liverpool Hope University, September 2011. “‘We are both maimed’: Disability and Trauma in Historical Romance.” Present Difference: The Cultural Construction of Disability, Manchester Metropolitan University, January 2010. “‘She was born a thing’: Disability, the Cyborg and the Posthuman in Anne McCaffrey’s The Ship Who Sang.” Present Difference: The Cultural Construction of Disability, Manchester Metropolitan University, January 2010. “Voyages of Self-Transformation: Corporeal Change and the Journey.” Eaton Science Fiction Conference, University of California, Riverside, May 2009. “Alternative Corporealities: Disability and Science Fiction.” Disability and Popular Fiction: Reading Representations, Liverpool John Moores University, May 2009. Conference report. “Teaching Disability and the Internet.” Disability and the Internet: Access, Mediation, Representation. Liverpool John Moores University, December 2008. “Genre Fiction and Disability Theory.” Rethinking Genre: The Politics of Cultural Form, Royal Holloway, University of London, June 2008. “Genre, Disability and Science Fiction.” National Popular Culture Association/American Culture Association Conference, San Francisco, California, March 2008. “Literary Disability: Why Genre Matters.” Cultural Locations of Disability: Situating a Cultural Disability Studies, University of Leeds, February 2008. “Absence and the Alien: Conceptualising the Alien Other in Science Fiction.” American Comparative Literature Association Conference, Princeton, New Jersey, March 2006. “Linguistic Science Fiction.” Academic Track, World Science Fiction Convention, Glasgow, August 2005. “Ursula K. Le Guin and Translation.” Science Fiction Research Association Conference, Las Vegas, Nevada, June 2005. “Native Tongues? Alien Languages and the Linguistics of Biology.” Eaton Science Fiction Conference, Seattle, Washington, May 2005.